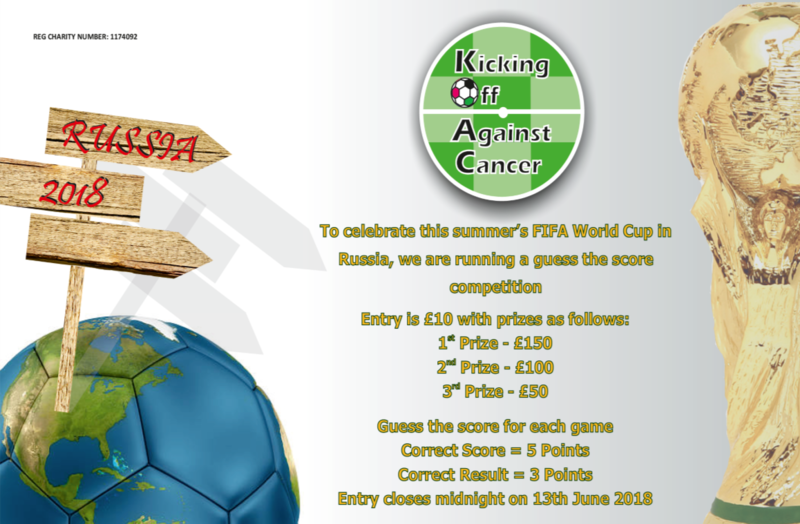 Predict the score of the 2018 World Cup matches and win big with Kicking Off Against Cancer. Whilst also raising money for good causes in the meantime! Points will be scored for each game: 5 points for each correct score 3 points for a correct result. Round one will be close at 23:59 on June 13th, we will need the predictions for all the group games shown on the entry form. Any missed games will be classed as an incorrect score. No refunds will be offered if you miss closing date. Entry forms can be changed up until the deadline for that round. Cost of entry is £10, this must be paid before the first closing date, forms will not be accepted if payment has not been made. Players will be put into a league table which will be emailed out once to all entrants after each round of this competition. winner: The total amount of goals scored in the 2018 FIFA World Cup, followed by; The total amount of yellow cards in the 2018 FIFA World Cup. The goals tie breaker will be used in the first instance with yellow cards only used if the first option has not decided a winner. Full terms & conditions of entry can be found below.